The Good Will Hunting star said he wanted to "learn before taking action"
Actor Ben Affleck has said he made a TV report on the Democratic Republic of Congo because the humanitarian crisis there deserved "our eyes and our ears". The Oscar-winner visited refugee camps, warlords and hospitals while in the African country to record a film for Nightline, on US channel ABC. In the past decade more than four million people have died during the conflict, most from hunger and disease. The 35-year-old has visited the country three times in the past year. It has been embroiled in a civil war since 1994, when an influx of refugees from neighbouring countries arrived. 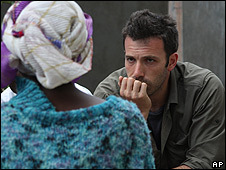 Cameras followed Affleck as he met conflict survivors, aid workers and warlords. "I view this as a long and ongoing learning experience to educate myself before making any attempt to advocate or speak out," the star of Good Will Hunting and Pearl Harbour said. "My plan has been to explore, watch, listen and find those doing the best work with - and on behalf of - the people of the DRC." He was trying to "give exposure to voices which might not otherwise be heard", he added. 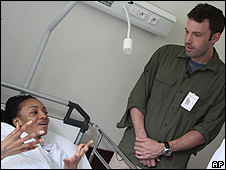 Affleck joins the long line of celebrities, among them Madonna, Angelina Jolie, George Clooney, Brad Pitt and Bono, who have campaigned for relief in the continent. But Affleck, who paid for the trip himself, stressed: "It makes sense to be sceptical about celebrity activism." "There is always the suspicion that involvement with a cause may be doing more good for the spokesman than he or she is doing for the cause," he added.